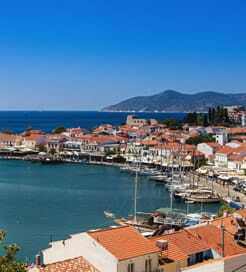 The Greek island of Samos is found just off the Turkish coast in the eastern Aegean and is one of the sunniest destinations in Europe. Famous for fine wine and fascinating historic sites, it was the birthplace of the mathematician, Pythagoras and, according to legend, the goddess of women and marriage, Hera. The Eupalinos Tunnel on the south coast is an Ancient Greek architectural masterpiece. It was built in 524BC with the purpose of allowing fresh water to run through the mountainside into the city of Pythagorion. It stretches a staggering 1,036m, although, only 100m is accessible to the public. Another must-see is the Heraion, a World Heritage site comprising scattered ruins of a sanctuary dedicated to Hera. It was built in the 6th Century BC, with archaeologists suggesting it was originally four times larger than the Parthenon. Many of the spectacular statues, pottery and sculptures that were excavated in the Heraoin have been moved to the Archaeological Museum in Samos Town, which is well worth a visit. However, Samos isn’t all about history. On the north coast lies Livadaki beach, a long sheltered cove with azure water and soft sand. Many beach parties are held here and you can enjoy free kayaking all day, which is the perfect way to end an afternoon of sightseeing. Another beautiful beach is found in Pythagorion on the south coast. It offers a huge stretch of pristine white sand with warm, clear water ideal for swimming. There are numerous ferry routes to Samos from the mainland and surrounding Greek islands. There are high-speed crossings almost every day from the Dodecanese Islands, Ikaria and the Aegean Islands, whereas the crossings from Lesbos and the Cyclades Islands take a little longer. If travelling from the Greek mainland, you will find ferry departure points in Kavala, Athens and Thessaloniki. These journeys take about a day with a few crossings every week. For more information, please visit our Ferries from Dodecanese Islands to Samos page. For more information, please visit our Ferries from Ikaria to Samos page. For more information, please visit our Ferries from Aegean Islands to Samos page. For more information, please visit our Ferries from Greece to Samos page. For more information, please visit our Ferries from Cyclades Islands to Samos page. For more information, please visit our Ferries from Lesbos to Samos page. For more information, please visit our Ferries from Athens to Samos page.